Adjustable beds cannot only relieve back pain but also act as stress busters and help in maintaining good health of the person sleeping on it. If one is suffering from osteoarthritis or asthma or spinal stenosis or varicose veins for that matter, the adjustable beds will give them a lot of relief. In earlier times these beds were a common occurrence only in healthcare field but now they are finding place in every household to meet the ever growing demand of continually ailing patients. Adjustable beds can be operated either manually or electrically. The adjustable beds come in different sizes and shapes and one has a lot of choice to select from and therefore, they can select the one that falls within their budget. The electrical adjustable beds are finding more takers as one need not strain themselves much trying to adjust the bed manually which needs quite a bit of strength to accomplish the task. These beds run on a noiseless motor with the help of which the bed mounts are operated. Buying the adjustable beds alone will not solve the problem and one has to choose the right kind of mattress too which help in relieving lot of pressure and thereby providing comfort and relaxation to the person sleeping on it. Adjustable beds have special features and the main one being the ability to adjust the bed to your convenient height which will help easy access to things around you. 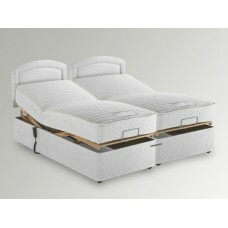 You will be able to adjust the angle of the bed so that you can ease the pressure on your back. You can have your legs on a raised position slightly above your knees. You must take care that you use an appropriate mattress that will suit the adjustable bed because the weight has to be distributed evenly so that the pain and pressure on the neck and back are relieved. Selection of the right mattress is a key factor here too. This Pocket Sprung adjustable bed offers an 800 pocket unit along with polyester fibre and a hand tu.. 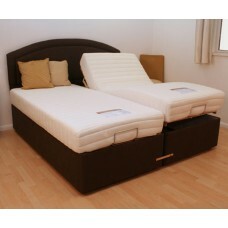 This Firm Memory Foam adjustable bed is manufactured with a mattress containing 50mm of v60 density .. This Pocket Sprung adjustable bed has two 1000 pocket sprung mattresses along with polyester and woo.. This pocket sprung and memory foam adjustable bed contains 50mm V60 memory foam mattress with a 1000.. This Soft Memory Foam adjustable bed has a mattress containing 80mm of v60 density memory on top of .. This Pocket Sprung and Memory Foam adjustable bed offers two 1000 pocket unit mattresses with top la.. This Pocket Sprung adjustable bed has a 1200 pocket sprung mattress with natural fillings including ..